No need for a Subwoofer. They hit the sympathetic harmonics of the house. Put on Wagner or Dire Straits,You can here the drums behind the band, or timpany behind the Orchestra. The imaging is incredible. Put on the gold disc of Dark side of the moon, they will take you there. 4 ohm impedence means you need a really decent preamp/amp set up, or an excellent receiver. I love these speakers, and I've had them for ages. Due to an accident, I just broke one of the binding posts, and I'm trying to source the best replacement. I would love to have another pair of these for parts/backup. I have 4 Time Window 7's in excellent condition.Black on Black, no tears, original, etc. In fact I have hardly ever used them as I've been listening to my Bose 901's. I read that only about 200 pairs were made..?? Question: What might they be worth wholesale/retail..?? I bought my DCM Time windows in 1980. At the time I was trying to decide between them versus Rogers LS3's and Magnapan MG1 the time windows sounded the best to me. I still have mine. They have been moved to the basement because I just purchased a surround system by PSB. I love to hear that everyone is still enjoying The Time Window 7! By the way I'm the guy that built them in Ann Arbor MI. Believe or not! Went from Time Window 1 to 1a to The best in my opinion the unbelievable Time Window 3! Then came the 7 WOW! Bought my DCM Time Window 7s on a 40% off whim when Incredible Universe went out of business in about 1996. I've kept them thru Yamaha to Rotel to Classe electronics and they just keep sounding better. Full range response, tight bass, super clear, with tons of space between and around the individual instruments and vocals. After 18 years with these beauties I'm getting the itch to change. Thinking about a side-by-side with some B&W 802s and Wilson Sophia 3s at the local high end shop. 5x the $, so it'll be very interesting to do the blind test. I'm really hoping to not hear a huge difference and leave with my Time Windows and a big smile! I thought I would never find a set of these DCM Time Window Sevens. Only about 200 pairs made, from what I understand. Found mine on Craigslist - the ad was for a "home theater system" - Onkyo 7.2 rec and 5 disk dvd player were the focus. The speakers were shown in the background - just said "and a pair of DCM speakers". When I got to the owners home, I almost lost it. The elusive Time Window Sevens!!! I reached in my pocket and gave them their full asking price without even hearing them. They are not perfect cosmetically, far from it, but they look good in a dark room. Brought my "new" speakers home and hooked them up to my Carver system (amp is a m1.5t) and WOW. The sound is awesome. I also have a pair of Klipsh KSP-400 speakers with the 15 inch woofers and built in amps. All I can say, is if you see a pair for sale - stop what you are doing and go listen to them. Take money with you. They probably won't be around long enogh for you to think about it (or get permission from the Mrs). The Jim Davis review is right - if you buy a pair of TW7's, you can sell your subwoofer - factor that into your costs. Hi: I'm new here but not new to audio. Have been dabling in music and audio for about 50 years. Own a recording studiuo & have much real pro gear there. 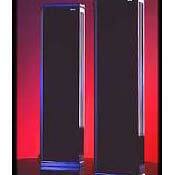 Have also been audiophile for years...just bought a vintage pair of DCM TW3s.......simply fantastic speakers!